The Harvard Commons Records are open for research. Access to fragile original documents may be restricted. Please consult the Public Services staff for further details. 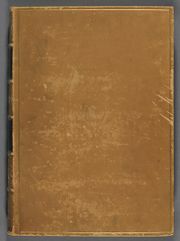 This volume, containing chronologically arranged papers mounted and bound around 1840, provides comprehensive documentation of the College commons around the turn of the 19th century. In particular, the volume documents the role the Steward played in overseeing the Commons. The records chiefly consist of the quarter reports of the Committee assigned to review the Steward's accounts. Other documents include lists of utensils, bills for dinners for the Corporation, Overseers, and Commencement, regulations, lists of abatements for students' quarterly bills, and information on kitchen staff.